Created in collaboration with Énergie Cardio in 2006, Opération Enfant Soleil’s Fonds Josée Lavigueur aims to promote kid’s physical and mental health through exercise. 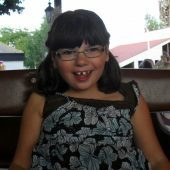 Change a child's life for better! Énergie Cardio has worked with Opération Enfant Soleil since 1999, and in that time, it has raised over $4,5 million for the organization, thanks to the participation of its 1, 500 employees and the generosity of its 80,000 members. The 5-Hour Cardio Challenge involves performing 5 hours of consecutive cardiovascular exercise, whether on a cardiovascular device or in group classes. And above all … this challenge is open to all (members and non-members of Énergie Cardio), and to each its own rhythm! 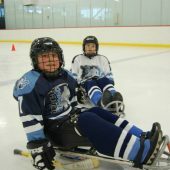 In Montréal, the grants given to the Association québécoise de sports pour paralytiques cérébraux, Défi sportif AlterGo and Hockey Québec have been used to purchase adapted equipment for disabled children, enabling them to maximize their autonomy and their participation in their communities. 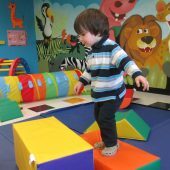 Several organizations, including Maternaide du Québec (Trois-Rivières), Patro Laval (Québec) and the CPE La Boîte à Bizous (Sainte-Catherine), were able to equip rooms and play areas with materials designed to stimulate and develop the psychomotor skills of children 5 and under. 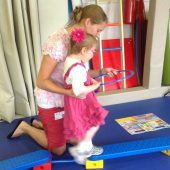 This equipment helps disabled children develop their tactile and sensory tolerance, as well as their independence. “This has taught Joanie to accept touch from others and to hold a glass in her hands, so she can drink from it herself.” —Marie-Claude Senécal, mother of Joanie Prévost, Montréal’s Enfant Soleil. This grant went toward purchasing equipment to make the small gym safer, more stimulating and more suitable for multiple purposes. The new set-up is used for rehabilitation and development activities for children with motor impairments or communication disorders. Thank you to Énergie Cardio, its employees and all the Défi Cardio 5 heures sponsors, participants and donors!